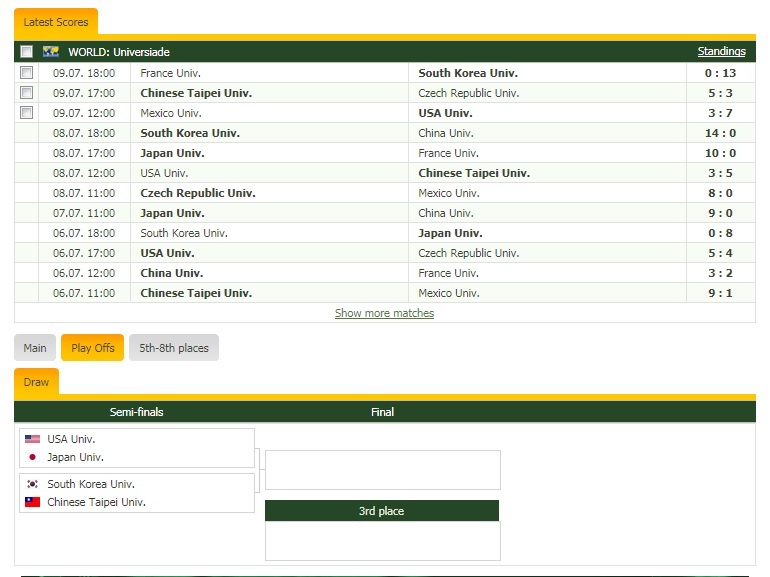 On Day 4 of preliminary on July 9, South Korea made runners-up for Pool A by defeating France 13-0, and Chinese Taipei and U.S.A. were winners in Pool B against Czech Republic 5-3 and Mexico 7-3 respectively thus secured the last 4 including Japan. The International Sport Cooperation Centre of Korea have hosted an education programme for student athletes taking part in the Gwangju 2015 Summer Universiade, under the theme “Champion’s Branding”. Organised by the International University Sports Federation (FISU), but run by the ISC, the programme attempted to teach around 100 students on how they can develop a better image in the new media environment. Around 13,000 athletes are currently participating at Gwangju 2015, with 21 different sports set to have taken place by the time of the Closing Ceremony on July 14.